1, Senior Lecturer, Department of Biochemistry, Faculty of Science, P.O. Box 812, University of Yaounde, Cameroon. This study deals with the analyses of the quantity of moisture, crude proteins, total lipids, carbohydrates, ash, crude fibre and calcium. These analyses were carried out in five different species of egusi seeds, which belong to the Cucurbitaceae family. These seeds are: Cucumeropsis mannii (egusi melon), Cucurbita maxima (pumpkin or squash gourd), Cucurbita moschata (musk melon), Lagenaria siceraria (bottle gourd or calabash) and Cucumis sativus (“Ibo” egusi). The moisture content was determined by drying in an oven to constant weight, crude protein content by Kjedahl method. Total lipids by Soxhlet, ash content by incinerating in a furnace and carbohydrates by the Bertrand’s method. The crude fibre content was the residue obtained after sequential hot digestion of the defatted sample with dilute acid and alkaline solutions. The calcium content was determined by the complexiometric method. From this study, it was noticed that the moisture levels (4.33 - 7.25% f.w) were similar to those of other oilseeds such as soybean and the fluted pumpkin seed. These egusi samples contained good levels of crude proteins (24.3 - 41.6% d.w), total lipids (42.9 - 57.3% d.w) and calcium (129.7 - 269.7 mg/100 g d.w). Their levels of crude proteins were similar to those of soybean and the fluted pumpkin but higher than that of groundnut (23% d.w), while the total lipid contents were similar to those of groundnut and the fluted pumpkin seed but higher than that of soybean (19.1% d.w). The carbohydrate contents of these seeds (4.56 – 10.2% d.w) are lower than those of groundnut (18.6% d.w) and the fluted pumpkin seed (14.5% d.w). The crude fibre levels (0.9 – 1.63% d.w) were lower than those of soybean (5.71% d.w) and groundnuts (5.15% d.w). The ash contents of these seeds (2.82 - 5.0% d.w) were similar to those of groundnuts (2.79% d.w), soybean (5.06% d.w) and the fluted pumpkin seed (3.4% d.w). Calcium levels compared well with that of soybean, higher than that of groundnut (49 mg/100 g d.w) and even higher than that of the fluted pumpkin seed (1.1 mg/100 g d.w). These egusi seeds can therefore be considered as an important source of plant proteins, lipids and calcium, which could be used in the fight against malnutrition. Key words: nutritional potential, Cucurbitaceae, egusi seeds. Cette étude analyse les potentiels nutritionnels de cinq espèces de courges de la famille de Cucurbitacées à savoir : Cucumeropsis mannii, Cucurbita maxima, Cucurbita moschata, Lagenaria siceraria et Cucumis sativus .Sept principes nutritifs ont été évalués : L’eau, les protides totaux, les lipides totaux, les glucides, les cendres, les fibres brutes et le calcium. Les résultats obtenus montrent que les teneurs en eau et en cendres sont généralement semblables à celles des autres graines oléagineux tandis que les teneurs en glucides et en fibres brutes sont plus faibles. Les courges contiennent essentiellement les protides totaux (24.3 - 41.6%), les lipides totaux (42.9 - 57.3% m.s.) et le calcium (129.7 - 269.7 mg/100 m.s). Leurs teneurs en protéines sont presque les mêmes que celles de Glycine max (soja) et de Telfaria occidentalis mais supérieure à celle d’Arachis hypogyaea (arachide) (23% m.s.) Les teneurs en lipides sont semblables à celle de Telfaria occidentalis mais plus élevées que celle de soja (19% m.s). Les teneurs en calcium sont presque les mêmes que celle de soja, mais supérieur à celle d’arachide (49 mg/100 gm.s) et plus élevées que celle de Telfaria occidentalis (1.1 mg/100 gm.s.). Au vu de tous ces résultats, nous sommes amenés à dire que ces espèces de courges constituent une source importante de protéines végétales, de lipides et de calcium qui sont indispensables pour la lutte contre la malnutrition. Good health is achieved by eating the right kinds and amounts of food. Well balanced human foods should contain adequate amounts of nutrients, the shortage of which leads to malnutrition, which is common in West Africa . Malnutrition is a major health problem in Cameroon, despite government’s efforts to promote food production. 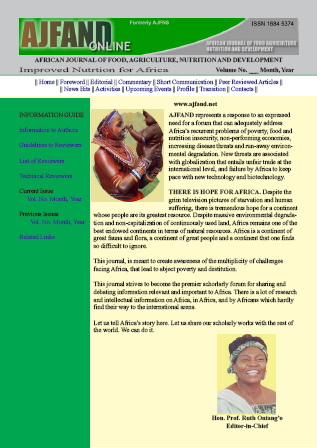 Protein-energy malnutrition in infants and children is one of the most common nutritional problems in Cameroon today . Faced with this problem, the Food and Agriculture Organization (FAO) of the United Nations and the World Health Organization (WHO) have been mobilizing their resources to seek ways of improving the living conditions of the poor. (b) An analysis of oil content and fatty acid composition of 36 species of seeds . Studies on melon seeds have been limited to the quality of proteins in four cultivated Cucurbit species  and a nutritional assessment of defatted oil meals of melon (Colocynthis citrullus) and fluted pumpkin (Telfaria occidentalis Hook) by Chick Assay . The underlying objective of all these studies has been to seek ways of supplementing the nutrient content of staple carbohydrate foods. The Cameroon population, for instance, can increase nutrient consumption either by the use of oil seeds and legumes or by increasing the nutrient consumption of expensive nutrient-containing foods of animal origin such as meat, milk and fish. Oil seeds remain the best option since the rural population can cultivate them. In Cameroon, there is a large variety of legumes and oil seeds such as egusi which are part of the traditional food system. However, the nutritional and economic values have not been completely determined, far less exploited, which are of good nutritional value similar to soyabean. Edible leguminous oil seeds are excellent sources of dietary protein. Preliminary results indicate that melon and fluted pumpkin seeds are good sources of dietary oil and their defatted meals are exceptionally higher in protein than in soyabean, peanut or sunflower seed meals . Vegetables such as cassava leaves, bitter leaves, huckleberry leaves, melon leaves and okra cooked with egusi are popular and a delicacy for many tribal groups in Cameroon. For bitter leaf soups, blends of groundnut, soybean and egusi are better appreciated for their odour, taste and mouth feel than soybean individually . Egusi seed kernels are major soup ingredients in Cameroon. They are used as a thickener and flavour component of soups. Egusi seeds are less expensive and widely distributed. They can contribute substantially towards obtaining a balanced diet and hence there is need to determine their nutritional potential. These five species of egusi seeds belong to the family Cucurbitaceae and are edible. They are annual, herbaceous, monoecious plants with climbing stems. The fruits are indehiscent smooth berries, which enclose many seeds . For consumption, they can be ground and used as ingredients to thicken soups or prepared into a paste commonly called egusi pudding. The Mankon people of the North West Province of Cameroon as a delicacy use this pudding, called the “traditional cake” by most tribes in Cameroon, during special occasions. The egusi seeds were bought in Yaounde (Melen market). These seeds were bought already dried under local conditions by the sellers and transported in polyethylene bags to the laboratory. While in the laboratory, they were cleaned with filter paper and dried to constant weight in an oven at 100 to 105 oC for 48 to 72 hours. They were ground using an electric grinder (BLENDER MILL/GRATER3), put in airtight bottles and stored in a dessicator. The moisture content was determined by drying in an oven at 100 to 105 oC for 48 hours . The crude protein content was estimated by the Kjeldahl method , which consists of digestion, distillation and titration. The nitrogen content (%) was converted to protein by multiplying by 6.25. Total lipids were determined using the Soxhlet method with petroleum ether (60 oC) as the solvent. The extraction was run for 6 hours and the solvent was removed using a rotatory evaporator. Ash was determined by incinerating in a Murfle Furnace at 550 oC for 48 hours . The carbohydrate content was estimated through the extraction of water-soluble sugars using the method of fractioning of carbohydrates. This was followed by the determination of the content of soluble reducing sugars and total water-soluble sugars by the modified Bertrand’s method  using Fehling’s solution and titration with 0.1N KMnO4. The crude fibre content was the residue obtained after sequential hot digestion of the defatted sample with dilute acid and alkaline solutions . The calcium content was determined by a complexiometric method, which consists of extraction of the biological material in water followed by titration with 0.002M NiSO4 . The statistical analysis of data was by Analysis of Variance (ANOVA) using 5% level of significance with the package being Genstat 4.2. This enabled us to see the significant differences between the nutrients of the various species of egusi seeds studied. The experimental design was a simple completely randomised block design with 5 varieties and 3 replications. The Duncan multiple range statistical test was used to compare between means. The results of analysis are shown in Table 1. The moisture content is given in grams per 100 grams fresh weight (g/100 g f.w.) while other contents - crude proteins, total lipids, reducing sugars, total water-soluble sugars, ash and crude fibre - are given in grams per 100 grams dry weight (g/100 g d.w.). The calcium content is given in milligrams per 100 grams dry weight (mg/100 g dry weight) .The values are given in the form: mean ± standard deviation. The standard error of means (S.E.M) is also given. From Table 1, the moisture contents of the egusi seeds analysed ranged from 4.33% f.w. (Cucumis sativus) to 7.26% f.w (Cucurbita moschata) with significant differences (P < 0.05) between all the samples. The moisture content of Cucumis sativus was similar to that of Pistacia vera reported elsewhere . The moisture contents of our samples were also similar to those of other oilseeds, which are also used as soup thickeners in Cameroon such as the fluted pumpkin, Telfaria occidentalis (5.0% f.w.) and the soybean, “M-79” (6.4% f.w.) . The crude protein contents of our samples range from 24.3% d.w. (C. sativus) to 41.6% d.w. (Cucumeropsis mannii), which is significantly higher than the crude protein contents of the other species (P < 0.05). This value of 24.3% d.w. for Cucumis sativus was closer to the value of 25.8% d.w. obtained for egusi (melon) seeds , 22.5% d.w. for the egusi, Pistacia vera, , and 26% and 23% for melon seeds and pumpkin seeds, respectively . Some of these values were lower than those reported for other oilseeds such as soybeans, Glycine max (40% d.w.) , the fluted pumpkin seed, T. occidentalis (30.1% d.w.)  and higher than that obtained for groundnuts, Arachis hypogaea (23% d.w.) . The total lipid levels fall between 42.9% d.w. (C. mannii) and 57.3% d.w. (C. sativus), which is significantly higher than the total lipid contents of the other species (P < 0.05). The lipid contents of C. moschata and Lagenaria siceraria are 48.6 and 47.2% d.w., with no significant difference between the lipid levels of these two species. These were similar to the value of 49.7% d.w. obtained for egusi (melon) seeds by . The fat content of Cucurbita maxima was also shown to be 45.6% d.w. . The total lipid content of Cucumeropsis mannii is 42.9% d.w., which was closer to that of Pistacia vera (45.7% d.w.) . The lipid contents of our samples also compared well with those of groundnuts (47.5% d.w.)  and the fluted pumpkin seed (47% d.w.) , but higher than for soyabeans (19.1% d.w.) . On the whole, the egusi samples studied have high lipid contents, thus classifying melon seeds as excellent sources of dietary oil . The oil can be used for cooking and in the fabrication of pomades and margarine. Also, seed kernels of the Cucurbit musk-melon (C. maxima) appear promising as substitutes for the highly priced cashew, almond and pistachio nuts in milk-based beverages and confections . The levels of soluble reducing sugars in these egusi seeds are between 0.49% d.w. (C. mannii) and 2.40% d.w. (Lagenaria siceraria) with significant differences between these values (P < 0.05). The total water-soluble sugars range from 2.87% d.w. (C. mannii) to 4.51% d.w. (L. siceraria), except C. sativus with a total water-soluble sugar content of 10.2% d.w., which is significantly higher than the total water-soluble sugar content of the other species of egusi seeds (P < 0.05). The carbohydrate contents of our samples determined by the Bertrand’s method were similar to those obtained by other researchers by the difference method. Such was the case of pumpkin seeds with a carbohydrate content of 10% d.w , which was quite close to that of Cucumis sativus. This means that Cucumis sativus can be considered an important source of energy and thus be used to prepare soups especially for people engaged in heavy activity. The values for egusi seeds were lower than those of other oil seeds such as groundnuts (18.6% d.w) and the fluted pumpkin (14.5% d.w.), obtained by the difference method [13, 17]. The presence of carbohydrates (especially reducing sugars) and proteins in our samples can result in non-enzymatic browning reactions leading to the formation of brown polymers and unfavourable modifications rendering the foodstuff inedible, thus decreasing its nutritional value. These modifications can take place if these samples are exposed in the atmosphere for long periods of time (several months). Non-enzymatic browning is the limiting factor in the preservation of these dehydrated samples . The crude fibre contents of these seeds are from 0.90% d.w. (Cucumis sativus) to 1.63% d.w. (Lagenaria siceraria), which is significantly higher than the crude fibre contents of the other species of egusi seeds (P < 0.05). The crude fibre contents were slightly lower than that of pumpkin seeds (2% d.w.)  and also lower than the cellulose content of 2.99% for the egusi, Pistacia vera . They were, however, much lower than the values obtained for oil seeds such as soybeans (5.71% d.w.) and groundnuts (5.15% d.w.) . On the whole, the egusi seeds studied have low fibre levels, an indication that they cannot be considered good sources of fibre. However, the fibre present in these samples, though of low levels, could contribute to the important role of fibre in the diet, that of helping to stimulate peristalsis, thus aiding the movement of food through the digestive system, thereby preventing constipation, according to Uddoh . The ash contents range from 2.82% d.w. (Cucumeropsis mannii) to 5.0% d.w. (Cucurbita moschata). There are significant differences (P < 0.05) between the ash contents of all the samples. The ash content of Pistacia vera was 3.14%  showing no marked difference. Our values also compared well with those of groundnuts (2.79% d.w.), soyabean (5.06% d.w.)  and the fluted pumpkin seed (3.40% d.w.) . The results show that our samples have significant amounts of ash, which are important sources of minerals. These minerals aid in the building of bones and teeth. Finally, the calcium contents of our samples vary from 129.7 mg/100 g d.w. (Cucurbita maxima) to 269.7 mg/100 g d.w. (C. mannii), which is significantly higher than the calcium levels of the other species of egusi seeds. These values were much higher than that of 40 mg/100 g d.w. for pumpkin seeds  and 53 mg/100 g d.w. for egusi and melon seeds respectively [15, 16]. The value for pumpkin seeds was also shown to be 57 mg/100 g d.w. . These values compared well with that of oil seeds such as soyabean (185 mg/100 g d.w.) but higher than that of groundnuts, 49 mg/100 g d.w. . They are very much higher than that of the fluted pumpkin seed, which had only a trace of calcium (1.1 mg/100 g d.w.) . However, the samples investigated in this study can be considered as sources of calcium, especially Cucumeropsis mannii with high quantities of calcium and crude proteins. This species is therefore good in the preparation of children’s soups. The proteins will help in the growth and maintenance of their tissues while calcium will help in the structure of their bones and teeth, thus helping to prevent rickets. Cucumis sativus can be considered as an important source of energy, Cucurbita moschata as a source of minerals and Lagenaria siceraria as a source of cellulose for digestion. These species can therefore be selected for desirable characteristics and made available to farmers for wider cultivation . The analysis of these egusi seeds has led us to conclude that the moisture and protein levels of these seeds are similar to those of soybeans and the fluted pumpkin seed. They have higher protein levels than found in groundnut. Their lipid and ash contents are similar to those of groundnut and the fluted pumpkin, while their carbohydrate and fibre levels are generally lower than those of these seeds. Their calcium levels are similar to that of soybeans but higher than that of groundnuts and the fluted pumpkin seed. On the whole, we can say from these results that Cucumeropsis mannii can be considered a source of protein and calcium, Cucumis sativus as a source of lipids and carbohydrates and Cucurbita moschata as a source of minerals. This study has enabled us to confirm the role of egusi seeds of the Cucurbitaceae family as a source of plant proteins, lipids, minerals and calcium in nutrition. •-Study the effect of some anti nutritional factors on the quality of the proteins. We are very grateful to the team of researchers of the Nutrition Centre of IMPM, Yaounde especially to the Chief of Centre and Dr Fotso Martin and the Laboratory technicians of this Centre for helping us to do the analysis of the lipids of our samples in their laboratory. Our sincere thanks also go to Mr Kengni Edouard for helping in the statistical analysis of our data. We are also very grateful to Prof. Tchiégang Clergé for his useful suggestions towards the realization of this work. Briend A Prévention et Traitement de la Mlnutrition (guide pratique. Edition de l’ORSTOM (Institut Français de Recherche Scientifique pour le Développement en Coopération. 1985: 7-8. Sharmer PB, Lal B, Madaan TR and SR Chatteyee Studies on the Nutritional Quality of Some Cucurbit Kernel Proteins. J. Sci. Food Agric, 1986; 4: 418-420. Nwokolo E and JS Sim Nutritional Assessment of Defatted Oil Meals of Melon (Colocynthis citrullus L) and Fluted Pumpkin (Telfaria occidentalis Hook) by Chick Assay. J. Sci. Food Agri.1987; 3: 237-246. Gwanfogbe RN, Chambers NE, Martin G, Fotso M and MF Smith Comparison of the Acceptability of Traditional Cameroon Sauces made with Addition of Oilseeds to Improve Nutritional value. Eco. Food Nutri. 1991; 25: 323-332. Stevels JMC Légumes Traditionnels du Cameroun. Une Etude Agro-botanique. Wageningen, Pays Bas. 1990 : 20-21,62-68,80, 132-153. AOAC. Official Methods of Analysis. 13th Edn. William Horwit (Ed.) Washington DC. 1980. Bergeret B La Chimie Alimentaire dans un Laboratoire d’Outre Mer. Organisation du Laboratoire; Etude Critique des Techniques d’Analyses Employées au Laboratoire de la section Nutrition de IRCAM, ORSTOM. 1955 : 1-56. Bertrand G Dosage de Sucres Réducteurs In: Guide pour les Manipulations de Chimie Biologie, Dunod et Pinat(Eds), Paris. 1913 : 20. Valnet J Se Soigner par les Légumes, les Fruits et les Céréales. 1985 ; 373: 415. Samant SK and DV Rege Some Enzymes and Enzyme Inhibitors from Cucurbit Seeds. J. Sci. Food Agric.1989; 47: 283. Cheftel JC and H Cheftel Introduction à la Biochimie et à la Technologie Alimentaire 1976 : 25-26.